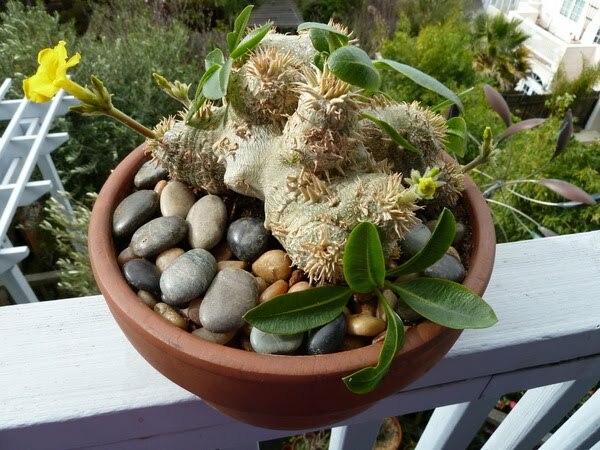 My beloved Pachypodium brevicaule has been behaving strangely for months. Back in September it declared Winter and dropped its leaves, and then around Thanksgiving started getting them back, months ahead of schedule. And then the other day i was scratching around its ears and noticed, omigod, inflorescences! Well, hell, maybe it’s May in Madagascar or something, but normally this time of year it doesn’t even have leaves. Look at this. Each inflorescence has several buds and there’s a fifth inflorescence hidden on the far side. It has never bloomed so vigorously for me. Oh, and speaking of the sun, we’re not complaining about its absence. No indeed. Here it is the end of January and the snowpack, upon which we depend for our water, is measurable over most of the Sierra in millimeters, so we took my friend CK’s advice and started doing our snow dance last week. It worked, as much of the Sierra got two feet of snow yesterday. Alas, we need between fifty and a hundred feet, depending on the location.